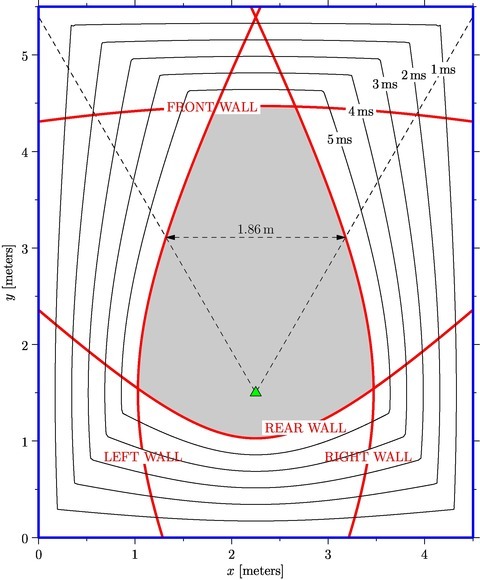 The graph shows a rectangular room plan with superimposed contours that show, for a fixed listening position, the delay time for first-order sound reflections as a function of loudspeaker placement. Each red curve indicates placements that yield exactly 6ms delay for reflection from a particular wall. The dashed lines are a guide: a pair of loudspeakers placed symmetrically on these lines will form an equilateral triangle with the listener. Also shown is the largest possible stereo separation (1.86m in the diagram above) that yields at least 6ms delay. The script is written in the asymptote vector graphics language. The variables defining room dimensions and listening position are near the top. Change these to match your own room. For now the code only works with rectangular rooms. placements for ≥6ms delay from all walls. Update 13.11.2014: Added code to show maximum stereo separation with equilateral placement and 6ms delay. Update 02.03.2015: Fixed a bug that affected showing the maximum stereo separation. How do I change speaker position ? I understand about the editing of “room dimensions” & “listening position”. Speaker position isn’t constant here. The graph shows the direct- to reflected-sound delay for *every* possible speaker position. It seems to me that the variable “equilateral” is used but not defined in this script? Oops, that was a bug. Fixed now. Thanks for spotting it! Viewing the EPS: If you have irfanview then get the postscript.dll file plugin and install it. Otherwise just drag and drop into microsoft word – looks ugly but does the trick. Deluxe viewing install ghostscript and ghostscript viewer. Set ghostscript viewer to Options > EPS clip to stop it from clipping off the right side of large rooms. Thanks lots Richard, for posting the script! Now I have to admit my defeat, that I’ve followed Chris’s instructions closely, and still only have errors not room graphs. Win7 64 system, followed steps up to installing GS, get error msgs when running refltime.asy. Tried many things, always using Admin mode with Notepad, saving all files… tried saving as ASCI, Unicode types. Thought I might have it when I noticed the path in Chris’s config.asy is slightly different from the MikTeX install dir, with no capital X at the end of MikTeX… but no. Hope someone can show me the error of my ways here…. I don’t have experience running this stuff under Windows (I use a linux machine for all my work so TeX, ghostscript, etc. are set up to work out-of-the-box) so sorry I can’t help here. Perhaps someone else can weigh in? the problem is with line 2 character 9 in config.asy. Copy pasting from my message results in an incorrect double quote (the left double quote). Just replace the funny double quote with a real one.